As an educator I find it very important for parents to continue with educational experiences at home. Whether it is due to summer break or having a child who does not attend day care/preschool. The hard thing for most parents is knowing what to do with your child and finding the tools. I shared with you my love for Bumble Brain Box. 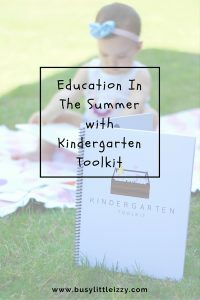 Now the ecstatic educator in me is excited to share Kindergarten Tool Kit with you. Yes, I get excited when I see educational subscription boxes and goodies. 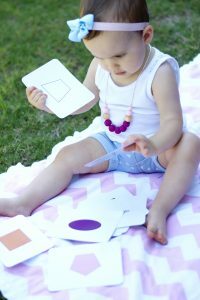 Yes I work on shapes with my 16 month old and matching, staking and sorting. I even talk about sinking and floating in the tub. I can’t help myself, I may not be teaching anymore, but I’m forever an educator. 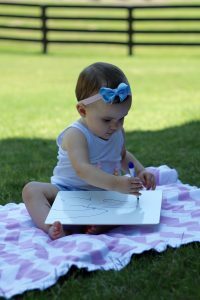 In the summer grab a blanket and enjoy the outdoors while working with your child. One of my favorite moments as a teacher and student was having lessons taught outside. Izzy is not going to kindergarten for a while, but that doesn’t mean we can start prepping for it. 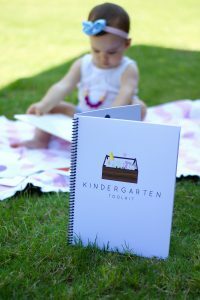 The Kindergarten Tool Kit is intended for children ages 2-6. My kit came with a dry erase board, eraser, marker & chalk. It also came with flash cards that covered shapes, letters numbers and beginning words. We worked on writing on the board. This helped Izzy to understand that we can create something from writing/drawing. We also explored the shapes and talked about their colors too. The booklet that comes in your box will give you ideas of what to do with your child. There are directions for each activity that clearly spell out what to do. Don’t know how to introduce sight words? This booklet will help you with that! One other aspect I love is on each page at the bottom there is an area called “Extras.” This is where if your child has mastered the task, you would look for further directions on what to work on next. 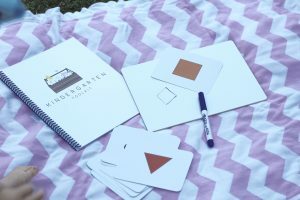 You can find Kindergarten tool kit here and on Instagram as well. I know I just love this so much! This looks like a great stepping stone into learning!!! Love it! I love this kit! Isabella could definitely get some use out of this. I was actually trying to figure out how to introduce sight words! You must check it out then! It will give you directions on what to do. 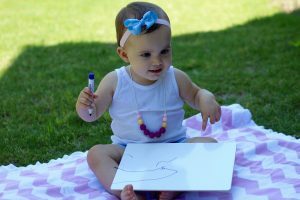 Have you started with letters and letters sounds yet? Sounds yes- but we need to start sight letters. We have an overload of flash cards too ? damn Target dollar spot. I love this! I’m like you…. Education is sooo important to me! This looks like an awesome tool. What a neat concept, I just love this so much! The teacher in me LOVES this! I learned when I was student teaching that the average student goes back two reading levels during the summer, simply because most kids don’t even read over the summer! This is an awesome box and I love the educational things inside! Thank you! I’m obsessed with all education things! This is a great box!